Dr. Mrs. OFOEGBU GRACE NYEREUGWU. Dr (Mrs) Ofoegbu, Grace N. is a Senior Lecturer in the Department of Accountancy, University of Nigeria, Enugu Campus. She obtained her secondary education at Girls’ Trade Centre Aba and graduated in 1975. She had her first degree in Accountancy Education at University of Nigeria, Nsukka and holds double Masters Degrees in Accountancy from both the University of Nigeria Nsukka (UNN) in 1990, and the Enugu State University of Science and Technology (ESUT) Enugu in 2000. She obtained her Doctorate degree from Nnamdi Azikiwe University (NAU), Anambra State in 2011. She qualified as a Chartered Accountant in 1999, and became a Fellow of the Institute of Chartered Accountants of Nigeria (ICAN) in 2013. She is an active member of Enugu & District Society of the Institute. Dr (Mrs.) Ofoegbu, Grace N. is an Associate Member of Chartered Institute of Taxation of Nigeria (CITN), a Fellow of the Institute of Industrial Administration of Nigeria (IIAN). 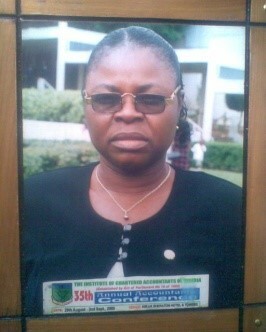 She joined the Department of Accountancy of the University of Nigeria, Enugu Campus in 1993. Dr (Mrs) Ofoegbu, Grace N. is a consultant and regular speaker at professional accounting and management workshops and other fora. She has attended many conferences and workshops. She is a practicing Christian, happily married and lives in Enugu with her husband and four children. She has undergone training on accounting packages and International Financial Reporting Standards (IFRS) and obtained certificates on Pastel Evolution Package and International Financial Reporting Standards (IFRS) conducted by Dafinone Consulting and ICAN respectively. She is computer literate. She has considerable practical experience in Accounting, Taxation and Auditing having started her accounting career in 1991 with Oganmba, Onyemelukwe & Co; an Enugu based firm of Chartered Accountants where she trained as an Auditor.